If you want to be a great fisherman than can catch a lot of different fish, it’s important for you to understand the ins and outs of all the fish types and this post is going to focus specifically on Northern Pike. We’ll talk all about Northern Pike Fishing Tips in the next section but, as you probably already know, Northern Pike are one of the more desired fish to go after on a fishing trip due in large part to their size and their ease of catching. As with anything, there are some tips and tricks to understand before you head out on the lake to go catch some Northern Pike. These fish can come in trophy size and they can even put up one heck of a fight so be sure you’re prepared at all times! By following the tips and tricks outlined below, you’ll be ready to catch Northern Pike on your next fishing trip! There’s a lot of different things that you should know when it comes to Northern Pike and the first thing is that they are carnivores and will eat living prey rather than vegetation or other food sources. Pike come in a ton of different sizes and even the smallest ones can often be aggressive and attack both their prey and anything else that comes near them, which means you need to take great care in handling them as I will mention below. Typically, pike will grow to about 30 inches in length and they can clearly be distinguished thanks to their head shape and the long slender build. They have incredibly sharp teeth that you should be aware of as they allow them to catch their prey. In terms of feeding, you’ll find that most pike will hide out in some weed areas or shallow water and just wait for the food to appear. Once the food is there, they will quickly and viciously attack the prey. The summer months are going to be your best chance at catching them with early summer being the greatest chance. Size matters when it comes to the size of the lure you are using to attract pike. 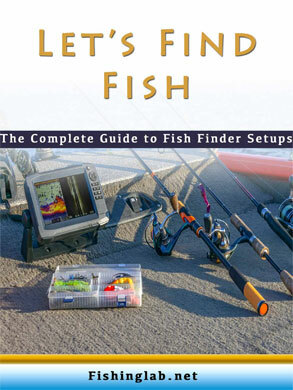 You need to make sure that you use much bigger bait and lures than you would use when catching other types of fish. If you are going after pike bigger than 10 pounds, you need to use a large lues. Typically, you should try and use a lure that is bigger than 8 inches and you can go ahead and choose whatever color you want since one color is not better than another. Pike are very quick fish and they move really fast when it comes to prey or your lure in the water. Make sure you are moving fast at all times because they will attack it no matter what. Additionally, if you move the lure across the water at a fast speed, it will allow you to attract more pike and cover more water. If it happens to be a sunny day out, try using a shiny lure to attract even more pike. When it is feeding time for Northern Pike, they like to hang out in shallow and weeded areas. When they are in these areas, they lay and wait until the food appears and then they attack. If you want to have the best success, try and fish in some areas that have shallow water and weeds for the best results. Additionally, the shallow water can make it a little bit easier for you to spot the pike if there are no obstructions in the water. If it hasn’t been said enough already, I’ll say it again. 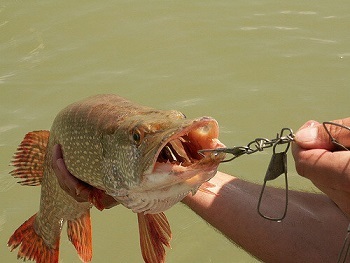 Pike have very sharp teeth and they are aggressive. If they happen to bite you and latch on to you, it’s going to hurt and be very uncomfortable and will hurt you. When you reel in a catch, I recommend using a net to bring it in instead of your hands. A net will ensure that you don’t have to worry about the catch getting away and it will also save your hands from getting bit by the pike. 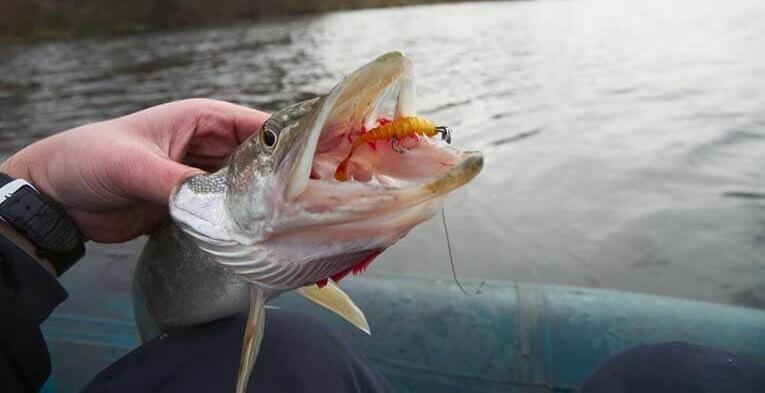 When it comes to fishing for pike, I can tell you right now that you do not want to go with regular line because the pike are too aggressive and will snap your regular line. There’s nothing worse than hooking a huge pike, almost reeling it in all the way and then having your line snap and the fish getting away. With their razor sharp teeth and aggressiveness, you want to ensure you use a 15lb braided line because it will be strong and hold up for both large and small pike. Perhaps the biggest problem that most fishers face is they overthink it. Don’t do that! Like many other fish species you probably already catch, pike fishing is not meant to be difficult and they’re actually a relatively easy fish to catch. They are very aggressive when it comes to food and they’re not picky at all. Thanks to these two characteristics, you can experience success by just placing the lure near the pike and waiting to see if they attack it. As mentioned above, you’re going to find that most Northern Pike want to lay out in the weeds while they are hunting for their food. They typically will stay still there and then attack the food once it is brought to them. Because of this, you want to make sure that you are hanging out in some of the more weeded areas since that’s where the pike will be. If you get a bite on your line, be sure to act quickly since they are often aggressive eaters. As with anything you go to fish, you need to make sure you have the right lure that makes it easy for you to catch the fish. For Northern Pike, you should try and use either a daredevils or jerk bait because both of those are closest to the fish that they look for naturally in the lake. In addition, you could try large spoons in order to catch the fish as best as you can. If you want the best results, try the daredevil since it was created to catch pike. When you catch any fish, especially a big one, you want to show it off and you might want to try and get close to it. However, when it comes to Northern Pike, I recommend that you stay away from it and avoid getting too close to the fish. These types of fish have very sharp teeth as mentioned above and if you get too close, they will bite you, which can lead to some serious discomfort on your end. If you’re fishing in the northern part of the United States or the southern part of Canada, you’re going to find that the best month to do so is May. This is the time of the year where Pike are most active and will be prowling the water looking for food. It’s the perfect time fo year where they haven’t seen a lure in a while which means that they’ll be more willing to jump at your lure in the water when they see it. As you can easily see, there are a lot of different things you need to remember when you head out on the lake to catch Northern Pike. Of course, you can follow these Northern Pike fishing tips and tricks as closely as possible and find that the fish just aren’t biting on a certain day and that’s okay! As long as you stick with it and follow these methods every time you head out on the water, you will greatly improve your chances of catching more Northern Pike and finally netting that trophy fish.